This report is split into two parts. The first part (Chapters 3 – 4) gives an over all overview of the global solar thermal market development in 2017. In addition, general trends are described and detailed 2017 data on successful applications, such as solar assisted district heating and solar heat for industrial processes, are documented. The second part (Chapters 5 – 8) presents detailed market figures for the year 2016 from 66 countries around the globe. The concluding chapter of the second part is focused on solar thermal system cost and levelized cost of solar heat for different applications and regions worldwide. 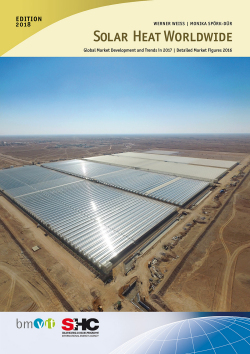 The cumulated solar thermal capacity in operation by end of 2017 was 472 GWth (675 mil lion square meters). Compared to the year 2000 the installed capacity grew by the factor 7.6. The corresponding annual solar thermal energy yield in 2017 amounted to 388 TWh, which correlates to savings of 41.7 million tons of oil and 134.7 mil lion tons of CO2. Despite these achievements, the global solar thermal market has faced challenging times in recent years. This is especially evident in the large markets in China and Europe where the traditional mass markets for small-scale solar water heating systems for singlefamily houses and apartment buildings are under market pressure from heat pumps and photovoltaic systems. In total, the global market declined by 4.2 % in 2017. Positive market developments were recorded in India (26 %), Mexico (7 %), and in Turkey (4 %). In contrast to the small-scale solar water heating systems, the mega watt-scale solar supported district heating systems and industrial applications have gained increasing interest all over the world in re cent years and several ambitious projects have been successfully implemented. By the end of 2017 about 300 large-scale solar thermal systems (>350 kWth; 500 m²) connected to district heating networks and in residential buildings were in operation. The total installed capacity of these systems equaled 1,140 MWth (1,630,415 m²), excluding concentrating systems that add 110,929 m². In 2017, nine large-scale solar thermal systems with about 35,000 m² (24.5 MWth) were in stalled in Europe. Outside Europe, 5.9 MWth (8,444 m²) were installed and one concentrating system in Tibet with a collector area of 9,000 m². About 75 % of the new collector area installed in Europe is from two new large systems in Denmark and three extensions added to Danish systems. About 92 % of the installed capacity installed outside Europe has been installed in China. The world’s largest plant for solar district heating is located in Silkeborg, Denmark and has an installed capacity of 110 MWth (156,694 m² flat plate collectors). The start of operation of this plant was in December 2016. Important to note is that in 2016 and 2017 three parabolic trough collector fields were installed for feeding into district heating networks in Denmark and China. The concentrating collector area of these three systems installed adds up to 110,929 m². Solar heat for industrial processes (SHIP) continues to be a growing market. A number of promising projects have been implemented in the last couple of years ranging from small-scale demonstration plants to very large systems with 100 MWth capacity. At least 624 SHIP systems, totalling 608,994 m² collector area, were in operation at the end of the year 2017. 2017 was a record year for SHIP installations – 124 new larger systems, totalling 192,580 m² collector area, started operating. With this, the documented world total grew in 2017 by 25 % in number of installed plants and by 46 % by installed collector area. The world’s largest solar process heat application began operation in February 2018 at the Amal oil field located in the south of the Sultan ate of Oman. The Miraah parabolic trough plant with a total capacity of over 100 MWth delivers 660 tons of steam per day for the extraction of viscous or heavy oil as an alternative to steam generated from natural gas. By the end of 2016, an installed capacity of 457 GWth cor responding to a total of 653 million square meters of collector area was in operation in the recorded 66 countries. These figures include unglazed water collectors, flat plate collectors, evacuated tube collectors and unglazed and glazed air collectors. The vast majority of the total capacity in operation was installed in China (324.5 GWth) and Europe (51.8 GWth), which together accounted for 82.3 % of the total installed capacity. The remaining installed capacity was shared between the United States and Canada (18.6 GWth), Asia excluding China (12.1 GWth), Latin America (12.3 GWth), the MENA1 countries, Israel, Jordan, Lebanon, Morocco, the Palestinian Territories and Tunisia (6.8 GWth), Australia and New Zealand (6.5 GWth), and Sub-Sahara African countries Bot swana, Burkina Faso, Ghana, Lesotho, Mauritius, Mozambique, Namibia, Senegal, South Africa and Zimbabwe (1.5 GWth). The market volume of “all other countries” is estimated to amount for 5 % of the total installations (22.8 GWth). With a global share of 71.6 %, evacuated tube collectors were the predominant solar thermal collector technology followed by flat plate collectors with 22.1 %, unglazed water collectors with 6.1 % and glazed and unglazed air collectors with 0.3 %. The top 10 countries – those with the highest market penetration were China, the United States, Turkey, Germany, Brazil, India, Australia, Austria, Israel and Greece. The leading countries in cumulated glazed and unglazed water collector capacity in operation in 2016 per 1,000 in habitants were Barbados (515 kWth/1,000 inhabitants), Austria (418 kWth/1,000 inhabitants), Cyprus (399 kWth/1,000 inhabit ants), Israel (397 kWth/1,000 inhabitants), Greece (292 kWth/1,000 inhabitants), the Palestinian Territories (289 kWth/1,000 inhabitants), Australia (269 kWth/1,000 inhabitants), China (236 kWth/1,000 inhabitants), Denmark (204 kWth/1,000 inhabitants) and Turkey (186 kWth/1,000 inhabitants). By the end of 2016 a capacity of 36.5 GWth, corresponding to 52.2 million m² of solar collectors, were installed world wide. This means a decrease in new collector installations of 9 % com pared to the year 2015. This downward trend however is less than the 14 % in the year 2014/15 and seems to continue in 2017 with recovering markets mainly driven by the growth in large-scale and solar process heat installations and the recovering market in China. The main markets in 2016 were again China (27.7 GWth) and Eu rope (3.2 GWth), which together accounted for 84.5 % of the over all new collector installations in 2016. The rest of the market was shared between Latin America (1.2 GWth), Asia excluding China (1.0 GWth), the United States and Canada (0.7 GWth), the MENA countries (0.4 GWth), Australia (0.4 GWth), and the Sub-Sahara African countries (0.1 GWth). The market volume of “all other countries” is estimated to amount for 5 % of the new installations (1.8 GWth). Of the top 10 kets in 2016, positive market growth was re ported from Denmark due to 31 large-scale installations and 5 extensions of existing plants in 2016 and from Mexico, where a strong committed supply chain and cost-effective residential market exists and the construction market with a wide range of applications (residential solar hot water collectors, residential and commercial swimming pools, agricultural drying systems, and an increased number of larger commercial SHIP and public building installations) is a growing sector. In Europe, the situation is almost the opposite compared to China with 74.9 % of all solar thermal systems installed in 2016 being flat plate collectors. In the medium-term perspective, the share of flat plate collectors decreased in Europe from 81.5 % in 2011 to 74.9 % in 2016. Driven mainly by the markets in Turkey, Poland, Switzerland and Germany the evacuated tube collectors did increase their share in Europe between 2011 and 2016 from 15.6 % to 23.5 %. In terms of newly installed solar thermal capacity per 1,000 inhabitants in 2016, Denmark took the lead followed by Israel and Cyprus in second position. China ranks fifth followed by Greece, Australia, Turkey, Austria and the Palestinian Territories. Distribution of systems by system type and application. The thermal use of the sun’s energy varies greatly from region to region and can be roughly distinguished by the type of solar thermal collector used, the type of system operation (pumped solar thermal systems, thermosiphon systems) and the main type of application (swimming pool heating, domestic hot water preparation, space heating, others such as heating of industrial processes, solar district heating and solar thermal cooling). World wide, more than three quarters of all solar thermal systems installed are thermosiphon systems and the rest are pumped solar heating systems. Similar to the distribution by type of solar thermal collector in total numbers, the Chinese market and Asia excluding China influenced the overall figures the most. In 2016, 89 % of the newly installed systems were thermosiphon systems while pumped systems only accounted for 11 %. In general, thermosiphon systems are more common in warm climates, such as in Africa, South America, southern Europe and the MENA countries. In these regions thermosiphon systems are more of ten equipped with flat plate collectors, while in China the typical thermosiphon system for domestic hot water preparation is equipped with evacuated tubes. The calculated number of water-based solar thermal systems in operation was approximately 113 million by the end of 2016. The break down is 6 % used for swimming pool heating, 63 % used for domestic hot water preparation in single-family houses and 28 % attached to larger domestic hot water systems for multi family houses, hotels, hospitals, schools, etc. Around 2 % of the world wide installed capacity supplied heat for both domestic hot water and space heating (solar combi-systems). The remaining systems accounted for around 1 % and delivered heat to other applications, including district heating networks, industrial processes and thermally driven solar cooling applications. Compared to the cumulated installed capacity, the share of swimming pool heating was less for new installations (6 % of total capacity and 3 % of newly installed capacity). A similar trend can be seen for several years now for domestic hot water systems in single-family homes: 63 % of total capacity in operation and 42 % of new installations in 2016 make this kind of system the most common application world wide, but it is showing a decreasing trend. By contrast, the share of large-scale domestic hot water applications is increasing (28 % of total capacity and 50 % of newly installed capacity). It can be assumed that this market segment took over some of the market shares from both swimming pool heating and domestic hot water systems in single-family homes. The share of solar district heating and solar process heat applications is steadily increasing despite it still only representing 3 % of the global market. Based on a comprehensive literature survey and data collected from detailed country reports, the number of jobs in the fields of production, installation and maintenance of solar thermal systems is estimated to be 708,000 world wide in 2016. The world wide turn over of the solar thermal industry in 2016 is estimated at E 16 billion (US$ 19.2 billion). Solar thermal markets are facing challenging times, which is partly due to increasing economic pressure from other renewable technologies. To address this, a special focus is being given to the economics of solar thermal systems in Chapter 8 of this year’s report. The economic analysis based on 2016 cost shows that there is a very broad range in system costs, and subsequently, the levelized cost of solar heat. The cost data shown below refer to end-user (customer) prices excluding VAT and subsidies. These costs are dependent on the system type (thermosiphon or pumped) and the application, such as small domestic hot water systems for single family homes, large domestic hot water systems for multi-family homes, small combined hot water and space heating systems and swimming pool heating systems with unglazed water collectors. Further more, the solar fraction and the climatic conditions play an important role. for small thermosiphon domestic hot water systems (Brazil, In dia, Tur key) and 7 – 8 E-ct / kWh for small pumped domestic hot water systems (Australia, China). For larger pumped systems in multi-family homes LCOH is lowest in Brazil and India (2 – 3 E-ct / kWh). Small combined hot water and space heating systems are cheapest in Brazil (3 E-ct / kWh). 11 – 19 E-ct / kWh for small combi-systems (Austria, China, Denmark, Germany, South Africa). For large-scale systems in Denmark (>10,000 m²), the average LCOH for diurnal storage is 3.6 E-ct / kWh. And for even larger systems (>50,000 m²) with seasonal storage attached, the average LCOH is 4.9 E-ct / kWh.